In 2013 South Dakotans planted 617,000 acres of sunflowers. No other state came close to this number of acres. North Dakota was second, planting just under 500,000 acres of sunflowers in 2013. Sunflowers have been a successful and profitable crop for many South Dakota farmers. "In 2011 gross sales or receipts for sunflowers in the state totaled $192,000,000," said Ruth Beck, SDSU Extension Agronomy Field Specialist. 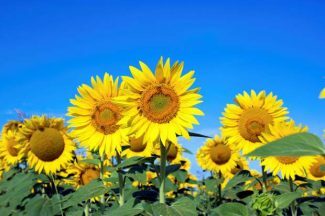 There are two types of sunflowers planted in South Dakota, Beck explained; oilseed types used for birdseed or crushed to make sunflower oil and confection types or those grown for human food markets. She added that seeds of the two types are easily differentiated. The oilseed type has small black seed and a thin hull or shell that adheres to the kernel. The confection or nonoil seed types have a thicker, larger, hull and a larger seed that is easily separated from the hull. The shells are usually a lighter shade and have some white striping. Typically the confection plants produce seed that has lower oil percentage and test weight. "Oilseed types are the most popular in South Dakota, being grown on about 86 percent of acres in 2013. They average around 42 percent oil content and are marketed into the oil and the birdseed markets," Beck said. As with any crop, variety selection is a very important part of production. "Sunflower varieties are hybrids and are therefore purchased each year from commercial seed companies," she said. When selecting hybrids, Beck encouraged selection to reflect desirable yields; high oil percentage for oil types, proper maturity, proper seed size for confection types, insect tolerance, and disease resistance. Standability and head position after flowering are also selection criteria. Although sunflowers are classified as intermediate in water use efficiency – yield per inch of water, Beck explained that they are often considered drought tolerant because they have a deep tap root. "This allows them to extract water from deep in the soil profile and also enables them to use nitrogen and other nutrients that leach below the root zone of shallow-rooted crops," she said. Because of this, she added that careful consideration should be given to the type of crop that follows sunflowers, in part, because their ability to scavenge water and nutrients can affect following crops. Sunflowers are produced primarily in the central and western region of South Dakota under no till crop production systems. No till systems rely heavily on diverse crop rotations, Beck explained. "Sunflowers should be planted in a diverse rotation in order to minimize issues with disease, weeds and insects. Since sunflowers are native to this area, risks from diseases are magnified by short sequencing of sunflowers in a crop rotation," she said. Sunflowers are commonly planted in rows that range from 20 to 36-inches using corn planters. However, they are sometimes seeded in narrower rows using a small grain drill or air seeder. At the present time, Beck said this seeding method is less than ideal because both depth control and seed singulation capabilities of these seeders is not as good as with row-crop planters. 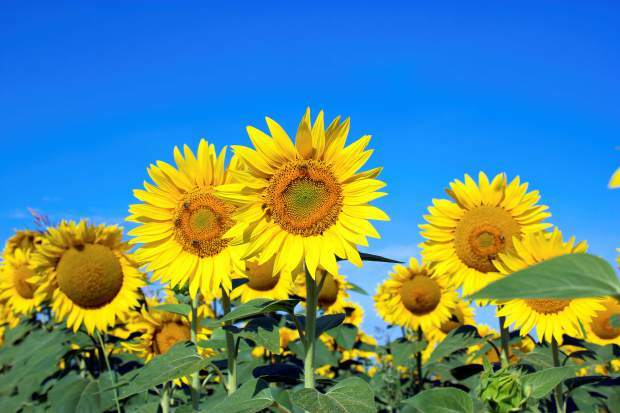 "Sunflowers are very sensitive to variation in plant spacing and planting depth uniformity. There is no advantage to going narrower than 15-inch spacing," she said. She explained further that if the producer was using a population of 27,000 plants/acre, 30 inch rows would place a seed every 7.5 inches; 20-inch rows have a seed spacing of 11.6 inches; 15-inch rows give seed spacing of 15.5 inches. Planting in 10 inch rows gives a seed spacing of over 23 inches within the row. Plant population of 22,000 to 27,000 plants/acre are common for oilseed types. Confection sunflowers are planted at lower plant populations than oilseed sunflowers as they need to attain large seed size. It is a common IPM practice in South Dakota to plant sunflowers in mid to late June. Beck said this can reduce insect and weed pressure and spread work load for farmers. It may also improve stand uniformity. "Oil is the last thing that a sunflower plant produces, therefore, late planted fields are dependent on moisture late in the season to improve their oil content," she said.